Jet Propulsion Labs, the brains behind the Curiosity Rover have created a scaled down verions of the famous Mars rover that anyone can build. This Customer Project note looks at the details of the project. This Customer Project feature looks at a semi-autonomous robot named ROVer. Rover is built around Actobotics parts, a pair of RoboClaw motor controllers and an Arduino. BasicMicro Motion Studio can be used to configure every aspect of the RoboClaw motor controller. The bulk of the configuration settings are made in the General Settings section of the application. This Application Note details the sections and settings contained within it. 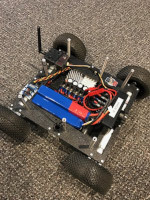 This User Project article takes a look at a unique robotic platform for remote video and image acquisition.